This eight year old Siamese cat has had differently sized pupils for some time but since the cat is not in any discomfort and can see, nobody was very worried. Today you are asked to see it, just for interest I guess. What might your differentials be and what tests would you do to come to a conclusion? This large a pupil concerns me. The cat has no pupillary light reflex, direct or consesual when light is shon into the eye and no consensual when the light is shon into the normal eye, though the direct is present and correct! My first thought was glaucoma. The intraocular pressure was indeed staggeringly high at 85mmHg but not normal in the sighted eye either, at 35mmHg. While glaucoma in the cat is normally secondary to uveitis there were no inflammatory signs in the eye. 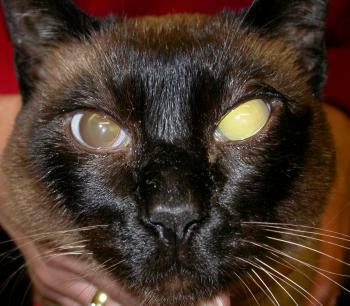 In the Siamese glaucoma can be seen as an inherited condition, as noted by Dr Glaze (Congenital and hereditary ocular abnormalities in cats. Clin Tech Small Anim Pract 2005;20:74-82). The condition is generally considered as an open-angle glaucoma but gonioscopy in this cat showed closed angles in both eyes. I’m not particularly worried about the dilated eye – its blind and always will be. But if we can prevent progression in the other eye we will stop the cat going bilaterally blind. We used Trusopt, a topical carbonic anhydrase inhibitor tid for treatment in the first instance. Latanoprost, my favourite glaucoma medication in dogs doesn’t work in cats as they lack the key prostaglandin receptor. This entry was posted in Cases and tagged anisocoria, cat, glaucoma. Bookmark the permalink.